If you want a Pokemon hoodie then come check out this Pikachu hoodie. The Pikachu hoodie is great for men and women and comes in sizes Small – 2XL and comes in black and navy blue and it is made from 90% cotton and 10% polyester. You can get this hoodie in the sweatshirt kind with one big front pocket or have one with a front zipper. 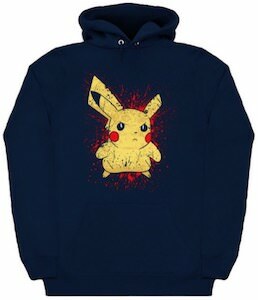 On the front of the hoodie you can find a mad looking Pikachu that looks like it is ready to battle or just won one as there are some blood stains around it. Pokemon fans will love having a hoodie like this and that makes this a cool present too. 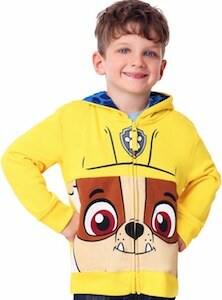 If Rubble is your child’s favorite PAW Patrol puppy then you should check out this kids Rubble hoodie. The PAW Patrol hoodie is yellow with on it a big face of the cute Rubble on the front and the fun hoodie has 2 pockets. You can get this PAW Patrol hoodie in kids sizes 2T – 5T and I am sure that the toddlers that love these cute puppies will love wearing this Rubble zip up hoodie. Now your toddler can feel like Rubble just by wearing this hoodie and I am sure that they will love you even more when you surprise them with this hoodie. Fan of Stranger Things can now have an amazing hoodie. This women’s hoodie is black and has white spots over it like the would be made by bleach splatters with makes them completely random. On top of the black you can find in red the Stranger Things logo so that it is clear that you like this Netflix TV show. The hoodie is made from 50% cotton and 50% polyester and just like the perfect hoodie it has a hood and the kangaroo style pocket. You can get this Stranger Things hoodie in women’s junior sizes Small – 3XL so that you can get the perfect size for you. If you like The Nightmare Before Christmas then you just have to check out this Jack Skellington zip up hoodie. It is a unisex zip up hoodie so that both men and women can enjoy wearing this amazing hoodie. 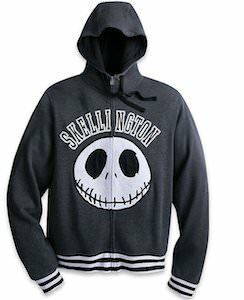 The hoodie is grey in color and has white and black stripes on the end of the sleeves and the bottom of the hoodie and on the front of the hoodie you can see the big head of Jack Skellington and above his head it says in big letters “Skellington”. You can get this The Nightmare Before Christmas hoodie in sizes Small – 2XL and the big front zipper makes this into a perfect jacket too. 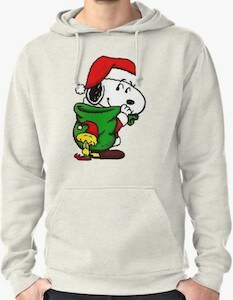 If you are looking for a fun hoodie for Christmas then you should check out this Snoopy and Woodstock Christmas hoodie. Peanuts fans will like the design on this shirt as it shows Snoopy dressed up as Santa Claus and he is holding a big green bag for the presents on his back and Woodstock is standing behind it. The Peanuts Christmas sweater is available in sizes Small – 2XL and it comes in many colors too. And I think it would make for the perfect Christmas sweater for men and women that love Snoopy and the little yellow bird Woodstock. If you like The Nightmare Before Christmas then you should check out this Jack Skellington scary Santa Christmas sweater. The sweater is available in many styles as a hoodie like on the picture but also as a sweatshirt and even as a t-shirt and it does come in unisex styles so that men and women can enjoy them in their favorite color and size. 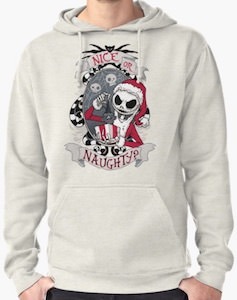 On the Jack Skellington Christmas sweater, you can see Jack dressed up as a scary Santa and around him, you can see skulls and banners saying “Nice or Naughty”. I really like the design and I am sure that is if you like The Nightmare Before Christmas then you should see this Christmas sweater. 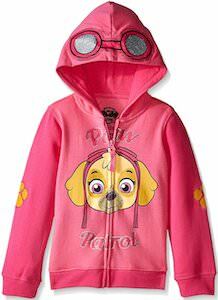 If your child loves PAW Patrol then this Skye hoodie is just perfect for them. The PAW Patrol hoodie is available in wide selection of toddler sizes and the pink color makes it perfect for a little girl. The hood of the hoodie has the goggles from Skye on it and a picture of Skye can be found on the front together with the text “PAW Patrol” and to make it more like a fun puppy hoodie they added a paw print to each sleeve. The PAW Patrol hoodie is nice a soft and has a zipper on the front making it the perfect go-to piece of clothing for your little girl. 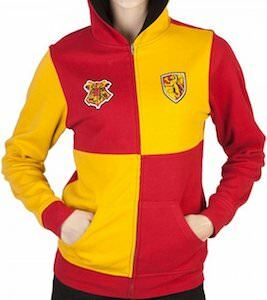 If you want a cool Harry Potter hoodie then you could check out this Gryffindor reversible hoodie so you get two in one. The women’s hoodie is available in junior sizes Small – 2XL and has a front zipper. The hoodie is black one one with the Gryffindor logo on it (click the picture to see it) and reversed the hoodie red and yellow just like on the picture above complete with the Gryffindor and Hogwarts logos. So now there is the perfect hoodie for a true Harry Potter fan like you and you can pick if you want to look flashing in red and yellow or more plain in black today all thanks to this two in one hoodie. 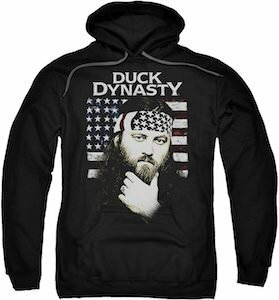 If you are looking for the perfect hoodie then you have to check out this Duck Dynasty Willie hoodie. The hoodie is unisex and that makes it perfect for both men and women and it is available in sizes Small – 3XL. The hoodie is black and the image on it looks like it is black and white but it does actually have color in it making it look really cool. On the hoodie you can see the US flag in the background with “Duck Dynasty” above it and in front of the flag, you can see Willie Robertson holding his beard and yes he is wearing his classic US flag bandana. 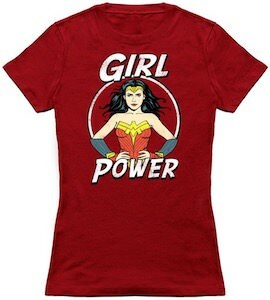 If you want the world to know about girl power then you need this Wonder Woman girl power t-shirt. The Wonder Woman shirt is also available as a hoodie or a tank top all with the same design. On the red shirt, you can see Wonder Woman at her best with her arms in her sides and that becomes part of a circle around the female superhero. around the circle, it says “Girl Power” and Wonder Woman is great at showing that. You can get this t-shirt in styles for men and women and it is available in sizes Small – 6XL.